"From a young age, I have trained six days a week, a few hours each time, so putting in a lot of hours in the gym feels natural to me." Katrin Tanja Davidsdottir was selected to represent Europe at the first-ever CrossFit Invitational in October. Her experience made her more determined than ever to qualify for the 2013 Reebok CrossFit Games. “(The) Invitational was definitely one of the best CrossFit experiences that I have had. It was such an honor to be a part of Team Europe and compete amongst all those great athletes,” Davidsdottir says. The experience pushed her to go all out at Regionals and earn her place at this year’s Games. The Icelandic has set herself a lofty goal for the Games after finishing in 30th place in 2012. “I have been working hard all year to get back there, and to do my best to finish in the final 12 and complete all of the events,” she says. Davidsdottir started CrossFit in September of 2011. Prior to that, she was a gymnast for 10 years, as well as a competitor in track and field. Like fellow Games qualifier, Caroline Fryklund, Davidsdottir believes her gymnastics background has given her a solid foundation for CrossFit. Even with the best preparation, the Regional Events challenged the best athletes. Davidsdottir found Event 4, the 100s, particularly tough. “It was both a very physically and mentally demanding workout, and I wasn’t in a good enough mindset that morning so it was very challenging for me to get through that event,” Davidsdottir says. Event 6 was a different story and she relished the chipper, finishing in first with a time of 8:31. She finished the Europe Regional in third place overall. In preparation for the Games, Davidsdottir is adding more volume to her training and focusing on weaknesses, which she cites as running, working with the rings and short, explosive workouts. 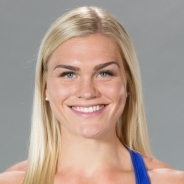 James Hobart has been programming for Davidsdottir, and she also has a good support team at CrossFit Stodin, where she trains six days a week. She is hoping the Games will involve shoulder-to-overheads, heavy snatches and handstand push-ups.